Order the one-sided card printer DTC1250e from HID FARGO at our YouCard Spring Special and consequently secure a free upgrade to the dual-sided printing version of DTC1250e – the HID FARGO DTC1250e Dual! In easy words: By ordering the professional card printer DTC1250e you’ll automatically receive the more functional dual version – for exactly the same conditions! Enjoy the advantages of dual-sided printing along with a great cost efficiency. The HID FARGO DTC1250e series is perfectly suited for small to medium card printing projects, where printing quality and a high printing speed of plastic cards play an essential role. Also a very economical consumption of printing supplies underline the benefits of the 1250e series. 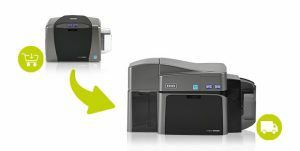 Convince yourself of the multiple advantages of the DTC1250e Dual printer! YouCard does not only offer special conditions for professional card printers – as the official partner of the branch leading producers, we are able to provide our customers with excellent service and technical support – of course without any extra costs.